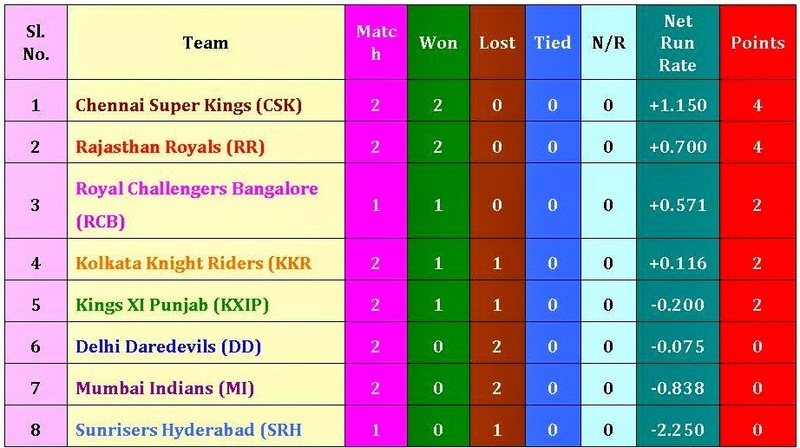 IPL8 2015 Points Table Matches Result Won Lost Tied & Net Run Rate, this year also same eight teams competing that including Chennai Super Kings, Delhi Daredevils, Kings XI Punjab, Kolkata Knight Riders, Mumbai Indians, Sunrisers Hyderabad, Rajasthan Royals, Royal Challengers Bangalore. All teams play 14 matches. Top 4 advance to Play-offs.